In 1957, and barely 23 years old, Fisher Tull (known as Mickey to his friends), came to Sam Houston State University where he became a beloved professor, mentor, and colleague to many. From 1965 to 1982 he served as Chairman of our music department and was instrumental in creating an award winningschool of music. In 1984 he was named a Piper Professor, a title that carried a prestigious award for excellence in teaching. In the same year, he was promoted to the rank of Distinguished Professor of Music. His accomplishments reached far beyond his importance as a composer, to include his exceptional teaching, his receptive temperament, his creative genius, and his constant desire to see his students succeed. He was born in Waco, Texas on September 24, 1934. After graduating from Waco High School in 1952, and after a brief interval as a professional musician traveling with a commercial dance band, he attended The University of North Texas in Denton where he received a Bachelor of Music in Music Education in 1956 and a Master of Music in Music Theory and Trumpet Performance in 1957. He studied trumpet with John Haynie and his primary composition teacher was Samuel Adler. He was also active as a jazz arranger for the lab band at UNT and also for Dallas area dance bands. While a student, he held teaching assistantships in trumpet and arranging. In 1956, he was appointed director of a second lab band that was created at UNT. After coming to SHSU in 1957, he continued his studies and earned a Ph.D. in Music Composition from The University of North Texas in 1965. As an administrator, he served as president of the Texas Association of Music Schools and was a member of the Board of Directors and the Commission on Undergraduate Standards of the National Association of Schools of Music. He received many commissions including those from the National Endowment for the Arts, Houston Symphony Orchestra, Houston Ballet, Houston Music Guild, International Trumpet Guild, the U.S. Army Band, the U. S. Air Force Band, Doc Severinsen, Steve Houghton, Kappa Kappa Psi & Tau Beta Sigma, the Sinfonia Foundation, International Trumpet Guild, National Association of College Wind and Percussion Instructors, Tubists United Brotherhood Associations, and numerous universities. His compositions number more than 80 including works for all mediums of performing groups such as, orchestra, band, chorus, and various chamber ensembles. His works have been published by many companies including, Boosey & Hawkes, Southern Music Company, Western International Music, Ludwig Publishing Company, TRN and the International Trombone Association Manuscript Press. Some of his works have been recorded by the London Symphony Orchestra, Los Angeles Brass Society, Philharmonic Brass, Millar Brass Ensemble, Doc Severinsen, and many other prestigious performers. Fisher Tull received awards in composition from the Texas Composers Guild, American Society of Composers, Authors and Publishers (ASCAP), National Flute Association, Willamette Arts Festival, the Friends of Harvey Gaul, the Ostwald Award from the University of Maryland, Artists Advisory Council of the Chicago Symphony Orchestra, and the Arthur Fraser Memorial. He was granted the Distinguished Men of Music medal by Kappa KappaPsi, and was awarded the Orpheus Award by Phi Mu Alpha Sinfonia. In 1993 he was named a Distinguished Alumnus by the UNT College of Music, and a scholarship is awarded every year in his name to a student in the SHSU School of Music. His musical style ranges from neo-classical to the more experimental. His music is diverse, exhibiting rhythmically vibrant melodies, sonorities reminiscent of Bartok and Hindemith, borrowings from liturgical music, and his obvious skill in the craft of Baroque counterpoint. Two popular styles of Post-War American music include the fascination with rhythm and the focus on neo-romantic melodies and lush harmony. His music demonstrates fluency of both styles, showing his versatility in and command of musical language. He often spoke about his absorption with the reproduced sketchbooks of Beethoven and Stravinsky and in 1984 he wrote that he carried a ‘multilingual concept’ into his compositions. He spoke about how he knew he wanted to be a musician when, at the age of nine, he found his first trumpet under the Christmas tree. He confesses that he was late coming to the composition of ‘serious’ music [his term] and was hesitant at the age of 29 as he began to step out of jazz, with which he was fluent, into the world of ‘legitimate’ music [his wording, again]. 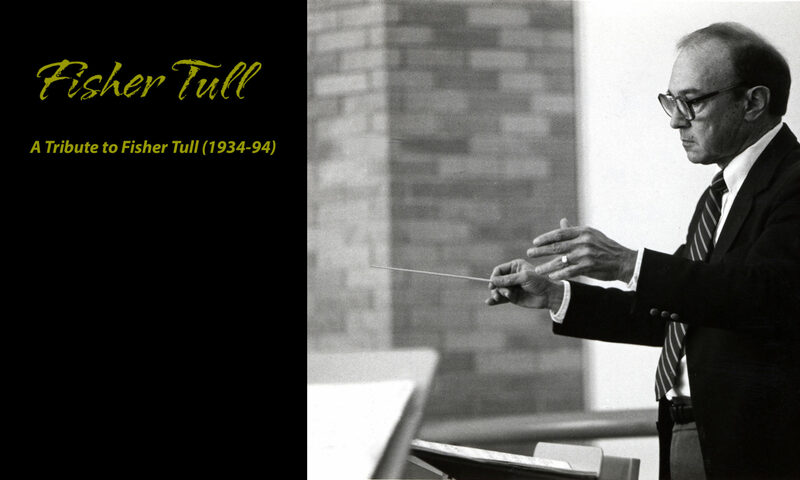 Fisher Tull was an innately gifted musician in so many aspects of our broad field of music. He was also a born teacher. His ease in the classroom and his clarity of thought, and the presentation of that thought, endeared many students to his gracious manner. His way of explaining the complex, sparking interest in us, and giving us the confidence to pursue our own ambitions has been invaluable in its worth. Inside his creative mind he was the first to be humble and grateful to his friends and family. In 1984, he included in his personal notes for our Contemporary Music Festival, a published tribute to his wife Charlotte, which is still imbedded in my memory. She continues to enhance our School of music in numerous ways and we are grateful to her for her ongoing support. He taught undergraduates and graduates alike and instructed us in so many ways in our growth as musicians. His kind demeanor and loving teaching spirit instilled in us a love for learning, creating, and ultimately, teaching. He remains a hero in our hearts and an inspiration in our lives. As a teacher, mentor, colleague, and friend, we salute you Mickey, and pay tribute to you today. Sheryl K. Murphy-Manley joined the faculty at Sam Houston State University in 2001 and is currently Associate Professor of Musicology. She holds a Bachelors of Music Education degree and a Masters degree in conducting from Sam Houston State University, as well as a Ph.D. in Musicology (1996) from the University of Texas at Austin where she taught in the undergraduate music department for four years as an Assistant Instructor and in the Continuing Education Program for ten years as a lecturer. She is a contributor to the newest edition of The New Grove Dictionary of Music and Musicians, edited by Stanley Sadie, and has written three articles (“Alessandro Scarlatti,” “Giovanni Battista Pergolesi,” and “Johann Adolf Hasse”) for the Reader’s Guide to Music: History, Theory, and Criticism, edited by Murray Steib in 1999. Dr. Murphy-Manley’s research in eighteenth century music, with her dissertation, “The Sacred Music of Gian Francesco de Majo (1732-1770),” has offered music historians editions of mid-eighteenth-century Italian music that have previously been available only in manuscript. She has presented papers at professional society meetings on various topics and has published an article, “Gianfrancesco de Majo (1732-1770): A Case of a Forgotten Eighteenth Century Composer,” in the fall of 2003. Her book, entitled A Concise and Friendly Guide to Music History, is published by Cengage Publishing, and is in its second edition (2006).